By 'capacity' we mean how many people can fit comfortably sitting in a Tipi. Tipis come with groundsheet, inner lining, raincatcher, coir matting, rugs, low table and lantern as standard furnishings. These prices include the transportation, setting up, dismantling of the tipis and commission to the festival. 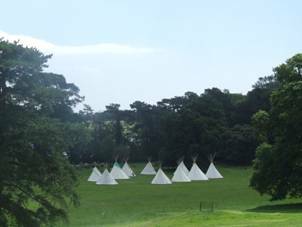 The Tipis are located in Barleyfields over the bridge from the main arena at the top of site as you enter from the car parks and campervan field direction. Pitched in a circle which radiates outwards into general camping. There is a toilet block on the approach into the Tipi circle. Showers which are open 8am to 8pm are located a 5 minute walk down the hill from the Tipis. There are also showers in the campervan field. Tipis can be hired either with standard furnishings and you can bring your own airbeds and bedding or if you don't fancy carrying lots of stuff optional extras can be added to give the Tipi a warm inviting atmosphere. Please note if you bring your own airbed you are responsible for bringing your own equipment and inflating it. Luxurious furnishings can be added to the standard Tipi hire. These include Indian 'Touran' mirrored hangings, sheepskins, a selection of large & small cushions & throws. Make your selection including your address to book and we will send a booking invoice. We require a deposit of 50% to book with the balance invoiced and payable a few weeks prior to the festival.